AMHERST, N.Y. (AP) — With a nine-day layoff between games, Buffalo’s players challenged each other in practice to stay sharp. Five players scored in double figures for Buffalo (4-0), which tied its record for points in a game since moving to Division I in 1994-95. The Bulls, who played without leading scorer C.J. Massinburg, have won their first four games for the first time since 1986-87, when they were in Division III. Buffalo cracked the AP Top 25 for the first time last week. Davonta Jordan and Jayvon Graves scored 16 points apiece for Buffalo, while Jeremy Harris and Jeenathan Williams each had 11. Ian Sistare scored 18 points for Dartmouth (3-2), all in the first half, and Chris Knight added 17. Massinburg was sidelined with a sprained knee suffered Monday in practice. The senior guard had a career-high 43 points in the Bulls’ win over then-13th-ranked West Virginia, and is averaging 20.3 points per game. He’s expected to return sometime next week. Buffalo made its first five shots. Dartmouth, meanwhile, missed its first eight before Sistare converted inside, and the Big Green never recovered. 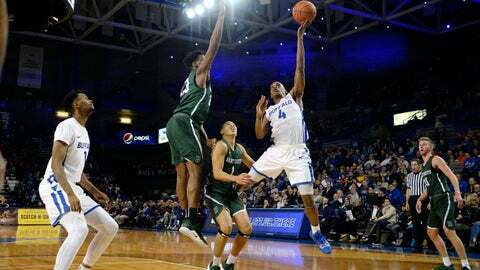 Dartmouth made a push to make the game competitive in the first half, pulling within 28-25, but Buffalo used its size and speed to get easy baskets. Ten different players scored in the first half as the Bulls built a 55-39 lead at the break. Buffalo shot 45 of 76 from the floor. The field-goal total was the most since Jan. 27, 1976, when the Bulls had 46 against Brockport State while playing at the Division III level. Buffalo is just the third team from the Mid-American Conference to be ranked in the AP Top 25 since 2000. The others were Kent State in 2008 and Ball State in 2001. Dartmouth fell to 3-55 against ranked teams. Its last victory over a ranked team was March 13, 1956, when the Big Green beat No. 14 West Virginia, 63-61. Dartmouth: At San Francisco on Saturday. Buffalo: Hosts Marist on Saturday.